Today has been a feedback kinda day, starting off with a group discussion with Richard Morris. We showed our chocolaty creations to Richard, to show how we had actually managed to make the idea work. Richard reaffirmed his position on the fact that we needed to contact the health sciences tutors to talk about food standards. 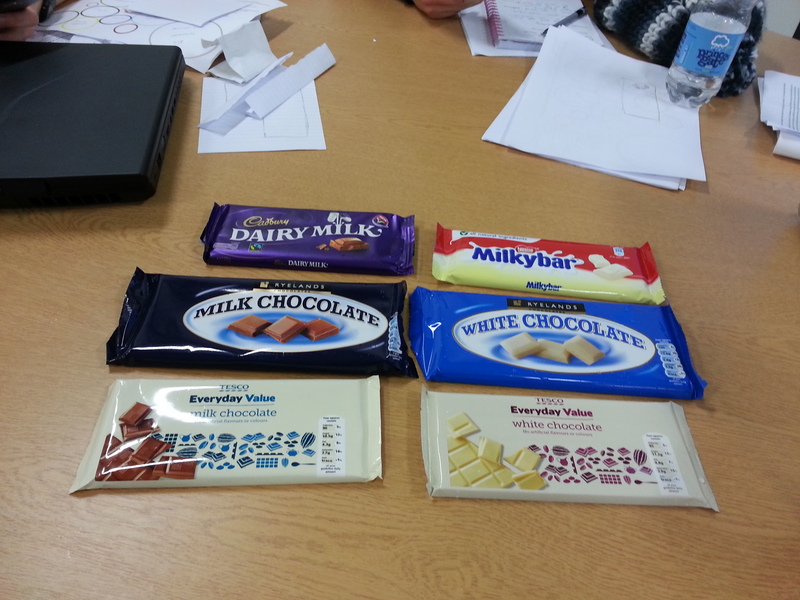 After an interesting debate about the progression of our chocolate idea, we ensured we had a collective discussion regarding the direction of our enterprise, especially focusing on what products we wanted to offer. We have now narrowed our product selection to Chocolates, Cakes, Cards and perhaps Candles. I feel that this decisive action is a necessity at this point in the business, which is a definite improvement in my personal skills, proving I have started to become more decisive. We are now at a point that we need to focus more heavily on the design, production, presentation and sale of these products. I feel a great deal more confident about the position of our creative collective now that we have a decent heading in the right direction. At this point, we decided to head over to the Health Sciences block (But not before I accidentally ate the majority of our development products…). Our adventure into the food sciences department was an interesting and informative one. Fortunately, we managed to bump into a researcher in the hallway and so we asked for some advice. The researcher was able to impart a great deal of information regarding who we should contact regarding chocolate moulding as well as what we would have to research regarding food standards, trading standards and material choice standards. We were unable to meet with the technical demonstrator as he was out of his office today, however we have email him explaining the urgency of our requirement for advice. As we came back to the studio, we were informed by Richard that we would be discussing our current progress with the other creative collective groups. Our discussions lead to two main points we needed to focus on – Brand Development & Product Development and Selection. Our brand development is a continual process that we are involved in, mainly being spearheaded by Micheal, our Graphic Designer. Our Name and Logo are already starting to build some identity, though the introduction of posters, business cards, uniforms and advertisement will he us improve this further into a brand people will trust and respect. Our Product selection has essentially come to a close now, where we have decided what products we will be focusing on. Our product development has now begun and will continue until we have a sales worthy selection of products. As product designers, Angelo, Lorna and I will be focusing heavily on product design processes we have honed in our studies to make products that are to the highest quality. Finally today, we came to the conclusion that we should begin some research into using different chocolates and choosing one or two brands or flavours that we felt made an attractive product but at the lowest price. Angelo and I went shopping to find different brands of chocolate to use in a taste test we had planned for the end of the day with all of the other groups. After a rigorous selection process on the 3 shelves of chocolate available in Tesco’s, we made our first company purchase. Upon arrival back at the university, it appeared that everyone had decided to leave before our test and so the tester chocolate will have to wait a while longer until Thursday for our taste test. Overall, today I feel I have a much better appreciation of what our business will need to succeed and what could be our shortcomings. I know now how important our brand identity is to the success of our company and I am now also confident that I know exactly what we are going to end up producing, advertising and selling!